Purpose: To evaluate the efficacy of cryopreserved amniotic membrane (CAM) in reducing signs and symptoms of dry eye disease (DED) in a large patient population. Methods: A retrospective chart review at 10 clinical sites was done of patients with refractory DED who received CAM and completed at least 3 months of follow-up. Data collected were demographics; medical history including previous and current ocular treatment, diagnosis, clinical presentations, comorbidity, duration and frequency of treatment with CAM; and concomitant medications. The primary outcome was the change in dry eye workshop (DEWS) score after treatment. Results: A total of 97 eyes of 84 patients exhibited severe dry eye despite maximal medical treatments including topical artificial tears, cyclosporine-A, serum, antibiotics, and steroids. 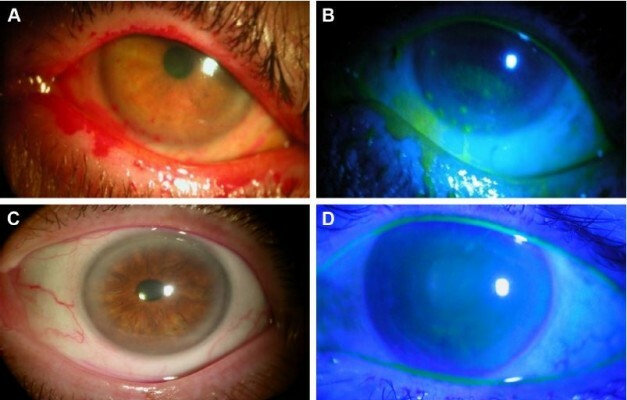 Patients manifested with superficial punctate keratitis (86%), filamentary keratitis (13%), exposure keratitis (19%), neurotrophic keratitis (2%), and corneal epithelial defect (7%). After CAM treatment for 5.4±2.8 days, 74 (88%) patients demonstrated an improved ocular surface along with a notable reduction of the severity as the overall DEWS score was significantly reduced from 3.25±0.5 at baseline to 1.44±0.6 at 1 week, 1.45±0.6 at 1 month, and 1.47±0.6 at 3 months (p<0.001). Ten eyes (10%) required repeated treatment to complete healing. Apart from discomfort during CAM placement, there were no adverse events. Conclusion: Placement of CAM is promising to enhance the recovery of ocular surface health and reduce signs and symptoms in patients with moderate-to-severe DED.